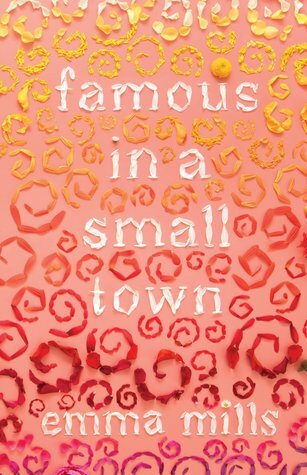 Famous in a Small Town by Emma Mills follows Sophie, a girl who tries to raise money for her high school band by inviting a famous country musician to her hometown for a music competition. Unlike her sister, friends, and country singer THIS NAME, who seem to want our of Acadia as soon as possible, Sophie loves her hometown. Then, August, a new boy next door moves to town and shakes up Sophie’s world. I’ve heard positive reviews about books by Emma Mills, so when I saw this title appear on NetGalley, I immediately requested it. When I started reading Famous in a Small Town, I questioned the hype. The story started slow and I couldn’t connect with the characters. However, the second half of the book really improved the story for me and I ended up enjoying the book as a whole. Like I mentioned earlier, this book started off extremely slow for me. Sophie is from a small town where nothing really happens and it seems like nothing really happens until about 35%-40% of the book, which is where I really found myself invested in the story according to my Kindle. At first, a lot of the character appeared really one dimensional. Her “good girl” friend Flora, her “bad girl” friend Brit, and the mysterious August all fell a little flat for me. Also, the synopsis led me to believe that inviting the famous musician back to town would be a bigger part in the story than it actually was, which made me confused why it took so long to get the ground running. However, the story really picked up for and I understand why everything looked so cut and dry in the beginning of the story. The main character, Sophie, sees everything as black and white. She has an idyllic view of her town and other people. This point of view at the beginning of the story really spoke to her as a character. As the story goes along, a lot of town mysteries are revealed. Each character has a story that impacts them deeper than what they show on the surface, including Sophie herself, which led to a surprising twist near the end of the book. Throughout the story, I found myself growing closer to Sophie and her friends. Their friendship is very authentic for high school students and I appreciated each character individually by the end of the novel. I liked finding out little details about each character to understand their motivations which carried the story along. I also found that I really enjoyed the overall message of this story. This is definitely a coming of age story where the main character is forced to realize the people and town she has known her entire life are not really what she knows them to be. Even though the books are fairly different this message reminded me of Save the Date by Morgan Matson, which I also enjoyed for this same reason. While this book started slowly for me, it was really worth it to see how everything came together at the end, even if it didn’t turn out as I expected. I can definitely see myself picking up another book by this author. I give this book 3.5 out of five stars. What are some books by Emma Mills that you have read? What did you think of them?